Modern business systems manage increasingly large volumes of data. Data may be ingested from external services, generated by the system itself, or created by users. These data sets may have extremely varied characteristics and processing requirements. Businesses use data to assess trends, trigger business processes, audit their operations, analyze customer behavior, and many other things. This heterogeneity means that a single data store is usually not the best approach. Instead, it's often better to store different types of data in different data stores, each focused towards a specific workload or usage pattern. The term polyglot persistence is used to describe solutions that use a mix of data store technologies. Selecting the right data store for your requirements is a key design decision. There are literally hundreds of implementations to choose from among SQL and NoSQL databases. Data stores are often categorized by how they structure data and the types of operations they support. This article describes several of the most common storage models. Note that a particular data store technology may support multiple storage models. For example, a relational database management systems (RDBMS) may also support key/value or graph storage. In fact, there is a general trend for so-called multimodel support, where a single database system supports several models. But it's still useful to understand the different models at a high level. Not all data stores in a given category provide the same feature-set. Most data stores provide server-side functionality to query and process data. Sometimes this functionality is built into the data storage engine. In other cases, the data storage and processing capabilities are separated, and there may be several options for processing and analysis. Data stores also support different programmatic and management interfaces. Generally, you should start by considering which storage model is best suited for your requirements. Then consider a particular data store within that category, based on factors such as feature set, cost, and ease of management. Relational databases organize data as a series of two-dimensional tables with rows and columns. Each table has its own columns, and every row in a table has the same set of columns. This model is mathematically based, and most vendors provide a dialect of the Structured Query Language (SQL) for retrieving and managing data. An RDBMS typically implements a transactionally consistent mechanism that conforms to the ACID (Atomic, Consistent, Isolated, Durable) model for updating information. An RDBMS typically supports a schema-on-write model, where the data structure is defined ahead of time, and all read or write operations must use the schema. This is in contrast to most NoSQL data stores, particularly key/value types, where the schema-on-read model assumes that the client will be imposing its own interpretive schema on data coming out of the database, and is agnostic to the data format being written. An RDBMS is very useful when strong consistency guarantees are important — where all changes are atomic, and transactions always leave the data in a consistent state. However, the underlying structures do not lend themselves to scaling out by distributing storage and processing across machines. Also, information stored in an RDBMS, must be put into a relational structure by following the normalization process. While this process is well understood, it can lead to inefficiencies, because of the need to disassemble logical entities into rows in separate tables, and then reassemble the data when running queries. Key/value stores are highly optimized for applications performing simple lookups, but are less suitable for systems that need to query data across different key/value stores. Key/value stores are also not optimized for scenarios where querying by value is important, rather than performing lookups based only on keys. For example, with a relational database, you can find a record by using a WHERE clause, but key/values stores usually do not have this type of lookup capability for values. A document database is conceptually similar to a key/value store, except that it stores a collection of named fields and data (known as documents), each of which could be simple scalar items or compound elements such as lists and child collections. The data in the fields of a document can be encoded in a variety of ways, including XML, YAML, JSON, BSON,or even stored as plain text. Unlike key/value stores, the fields in documents are exposed to the storage management system, enabling an application to query and filter data by using the values in these fields. Typically, a document contains the entire data for an entity. What items constitute an entity are application specific. For example, an entity could contain the details of a customer, an order, or a combination of both. A single document may contain information that would be spread across several relational tables in an RDBMS. A document store does not require that all documents have the same structure. This free-form approach provides a great deal of flexibility. Applications can store different data in documents as business requirements change. A graph database stores two types of information, nodes and edges. You can think of nodes as entities. Edges which specify the relationships between nodes. Both nodes and edges can have properties that provide information about that node or edge, similar to columns in a table. Edges can also have a direction indicating the nature of the relationship. The purpose of a graph database is to allow an application to efficiently perform queries that traverse the network of nodes and edges, and to analyze the relationships between entities. The following diagram shows an organization's personnel database structured as a graph. The entities are employees and departments, and the edges indicate reporting relationships and the department in which employees work. In this graph, the arrows on the edges show the direction of the relationships. A column-family database organizes data into rows and columns. 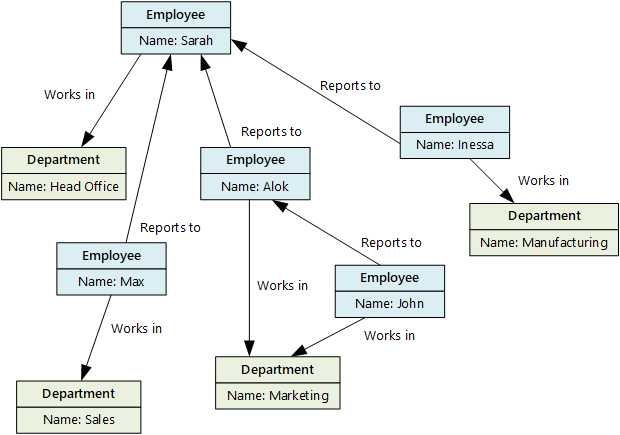 In its simplest form, a column-family database can appear very similar to a relational database, at least conceptually. The real power of a column-family database lies in its denormalized approach to structuring sparse data. You can think of a column-family database as holding tabular data with rows and columns, but the columns are divided into groups known as column families. Each column family holds a set of columns that are logically related together and are typically retrieved or manipulated as a unit. Other data that is accessed separately can be stored in separate column families. Within a column family, new columns can be added dynamically, and rows can be sparse (that is, a row doesn't need to have a value for every column). The following diagram shows an example with two column families, Identity and Contact Info. The data for a single entity has the same row key in each column-family. This structure, where the rows for any given object in a column family can vary dynamically, is an important benefit of the column-family approach, making this form of data store highly suited for storing structured, volatile data. Unlike a key/value store or a document database, most column-family databases store data in key order, rather than by computing a hash. Many implementations allow you to create indexes over specific columns in a column-family. 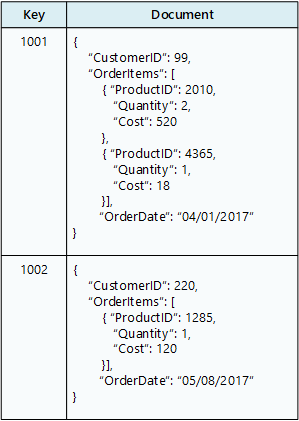 Indexes let you retrieve data by columns value, rather than row key. Read and write operations for a row are usually atomic with a single column-family, although some implementations provide atomicity across the entire row, spanning multiple column-families. Data analytics stores provide massively parallel solutions for ingesting, storing, and analyzing data. This data is distributed across multiple servers using a share-nothing architecture to maximize scalability and minimize dependencies. The data is unlikely to be static, so these stores must be able to handle large quantities of information, arriving in a variety of formats from multiple streams, while continuing to process new queries. A search engine database supports the ability to search for information held in external data stores and services. A search engine database can be used to index massive volumes of data and provide near real-time access to these indexes. Although search engine databases are commonly thought of as being synonymous with the web, many large-scale systems use them to provide structured and ad-hoc search capabilities on top of their own databases. The key characteristics of a search engine database are the ability to store and index information very quickly, and provide fast response times for search requests. Indexes can be multi-dimensional and may support free-text searches across large volumes of text data. Indexing can be performed using a pull model, triggered by the search engine database, or using a push model, initiated by external application code. Searching can be exact or fuzzy. A fuzzy search finds documents that match a set of terms and calculates how closely they match. Some search engines also support linguistic analysis that can return matches based on synonyms, genre expansions (for example, matching dogs to pets), and stemming (matching words with the same root). Time series data is a set of values organized by time, and a time series database is a database that is optimized for this type of data. Time series databases must support a very high number of writes, as they typically collect large amounts of data in real time from a large number of sources. Updates are rare, and deletes are often done as bulk operations. Although the records written to a time-series database are generally small, there are often a large number of records, and total data size can grow rapidly. Time series databases are good for storing telemetry data. Scenarios include IoT sensors or application/system counters. Object storage is optimized for storing and retrieving large binary objects (images, files, video and audio streams, large application data objects and documents, virtual machine disk images). Objects in these store types are composed of the stored data, some metadata, and a unique ID for accessing the object. Object stores enables the management of extremely large amounts of unstructured data. Sometimes, using simple flat files can be the most effective means of storing and retrieving information. Using file shares enables files to be accessed across a network. Given appropriate security and concurrent access control mechanisms, sharing data in this way can enable distributed services to provide highly scalable data access for performing basic, low-level operations such as simple read and write requests.